On Saturday morning the boys & I are taking part in a charity walk. While there seem to be a lot of walks & fundraisers this time of year, this particular walk is special. The reason it's so special is because of one little boy. Charlie is one of my Kindermusik students who has been diagnosed with Tuberous Sclerosis Complex, a disease that for now, has no cure. 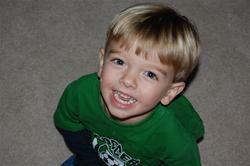 He was diagnosed in July 2008 at just 16 months old. It started with a febrile seizure, which as many of you know, my boys are prone to as well. The instant his mom told me that was the starting point, she had my attention. Anytime I hear the words "febrile seizure" I go back to our first one with Jackson. The fear... the shock... wondering if your child's life is forever changed by this event. I've stood in St. Vincent's ER, holding my post-seizure, unconscious child, praying for everything to be ok. I've been incredibly lucky because each time those prayers have been answered. (For now, we are in the clear as our case seems to be only linked to fevers.) However, Cara Cowlin, Charlie's mom, has to deal with the fact that her child has something more serious. In that moment when my fears were calmed, hers were confirmed. After numerous tests, they found the tubers in Charlie's brain. This is the cause of his seizures, which can change as he grows. In fact, one of the scariest parts of this disease is that it can change at any time. Right now the Cowlins feel blessed to be diagnosed with a mild case. Here's hoping that remains the case until a cure is found. Walking for Charlie on Saturday is one of the ways I can say "thank you" for avoiding a diagnosis like this with my boys. Who knew I'd be so thankful for the cards we've been dealt?!? As scary as Jack & (my) Charlie's seizures have been, I'm reminded quite frequently that it could be much worse and that we really are very blessed. I'm hopeful that Saturday's walk will leave Cara feeling blessed too. While she must deal with this disease & the effect it will have on her son's life, she is surrounded by love & support. Hope the walk is wonderful! I know Charlie and his Mommy will be glad to see Miss Aly there!